If not communicated artfully, even the most insightful, revolutionary and brilliant idea might be ignored and forgotten. 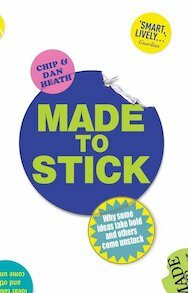 This book is a manual on how to make ideas “stick”, so that they are understood and have a lasting impact, changing the audience’s opinions or behaviour. While traditional methods focus on improving our delivery of the message, structuring our presentation in certain ways, and repeating the key message again and again, this book looks into the traits that make ideas sticky. Find the core idea by weeding out superfluous and tangential elements. Stories: We must tell stories to get people to act on our ideas, preparing them to act quickly and effectively. Profound and compact ideas pack a lot of meaning into a small message. To do this we can tap into the existing memory schemas of our audience. Schemas are collections of generic properties of a concept or category. They consist of a lot of prerecorded information in our memories. By calling up schemas in our messages we can communicate concepts much faster than if we mechanically listed all the attributes of our ideas, improving on both their comprehension and the ability to recall them. Start with simple, stripped-down examples that can be easily understood with little context. Once the basic schema is established, we can stretch this schema along the desired dimensions. Using “schemas” and analogies might seem a slower path to “real truth” (i.e. communicating our message in its completeness and with perfect accuracy) but they help us communicate our ideas effectively, avoiding the Curse of Knowledge. Good examples of analogies are “generative”: they are platforms for novel thinking that generate “new perceptions, explanations, and inventions”. Mental schemas help us predict what will happen and make good decisions. When they fail and the unexplainable happens we are surprised: the event jolts our attention, we pause and reflect, so that we can repair our machines. Communicate the message in a way that breaks the audience’s guessing machine along the counterintuitive dimension. Sticky ideas help us break the complacency of common sense and rewrite existing schemas in the mind of our audience. To make this work we need to know how people’s schema are defective, swift the rug from underneath them with surprise, and then provide them powerful insights to help make their mental models better. Curiosity happens when we feel a gap in our knowledge; to sustain attention, we must feed people’s curiosity with a steady stream of open questions: the desire to fill this gap in our knowledge will keep them interested. We need to shift our thinking from “What information do I need to convey?” to “What questions do I want my audience to ask?”. We should hence provide our audience with context, highlighting something they already know, and then point out gaps in their knowledge to convince them they need our message. Abstraction is the luxury of the experts: when talking about their ideas, experts see the patterns and insights they have learned with years of practices. Yet, for novices these higher abstractions are out of reach, as the necessary foundations are missing. Presenting ideas in abstract ways makes them harder to remember and to coordinate with others, which might interpret the abstraction in other ways. Concreteness creates a shared “turf” on which people can collaborate, feeling comfortable they’re all tackling the same challenge, helping our idea be both understandable and memorable. Teaching about abstract behaviours (e.g. discrimination) and skills (e.g. accounting) can be more effective by experiencing these first-hand. Concreteness is perhaps the easiest trait to add to our ideas; the barrier is simply forgetfulness: it’s easy to forget we’re talking like an expert, the curse of knowledge makes it feel unnatural to talk concretely about a topic we’ve known for years. What makes people believe ideas? We believe because of experiences, faith and authorities; this means that, when trying to make people believe a new idea, we’re fighting an uphill battle against a lifetime of convictions made by personal learning and social relationships. The first is authorities, reliable sources that can back up our ideas. The first type of authority is an expert, the kind of person whose wall is covered in framed credentials. The second type are celebrities and aspirational figures: we trust these people whom we want to be like. When accessing the endorsement of the first two types is not viable, we can tap into the credibility of an anti-authority: sources that have a powerful connection to our core idea because of their personal story and, are having nothing to gain, are trusted because of their honesty and trustworthiness, not because of their status. A second way to is by making our claims more tangible and concrete, so that they can vouch for themselves, by adding relevant details that support our core ideas, to make them seem more real and believable. Statistics work well, yet they are rarely helpful by themselves: statistics should be used to illustrate a relationship, as the relationship is more important to remember than the number, and to get our audience make up their mind on an issue. it’s the human-scale and the context that makes them so. A third way doesn’t rely neither nor authority nor numbers: proving with a concrete example we are clearly (over-)qualified for the job: “if you’ve made it there, you can make it anywhere”. A fourth way is with testable credentials, claims that can be immediately verified by your audience (“see for yourself!”). It’s not always obvious which of these approaches we should use, so the key here is perseverance: we should try to mix and match these approaches, knowing when it’s time to draw from a different well.